I am wishing there was some way to write the grunts from Tim the Toolman Taylor on the old show Home Improvement. The way he grunted when he wanted to be all manly. 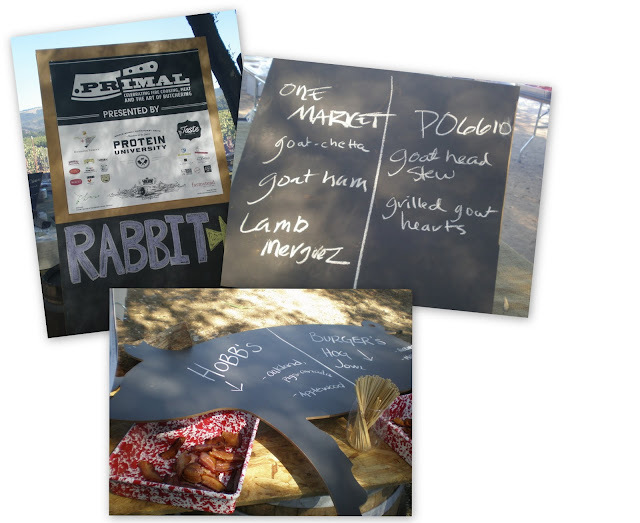 Those grunts are appropriate for Primal - a carnivore feast that was held in Napa this weekend. It's touted as, “Celebrating Fire Cooking, Meat and the Art of Butchering”. Here you see Kari Underly from Chicago cutting out the flank steak from a hind quarter of beef. She had just won the award as Best Butcher in the country. Behind the prep tables it looked like a primitive, tribal sacrificial landscape. It was a crucifixion ground with rabbits, goats, pigs, cow, and chickens stretched out and being smoked and roasted over open fires. 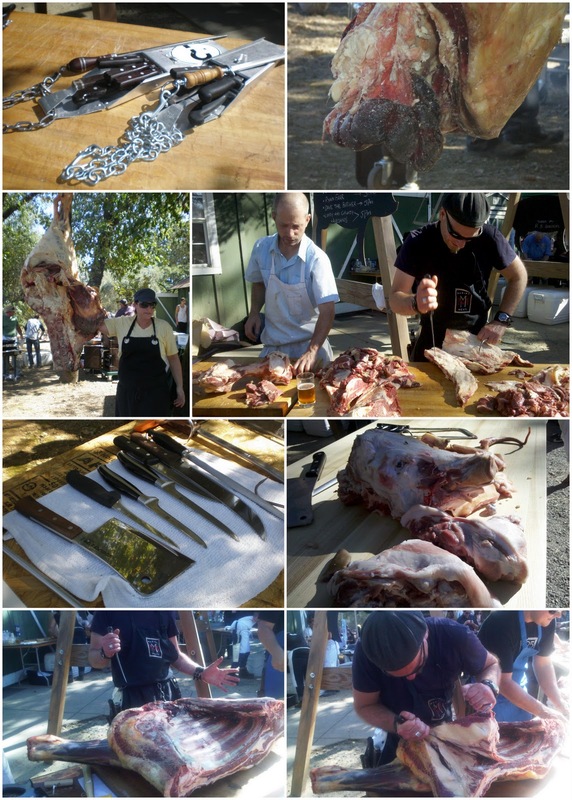 There was lots of butchering. What you see dangling off the beef carcass is the kidneys. I asked why the kidneys had not been removed with all the other organs and was told that it was because the organs are all contained in a sac that drops out of the body cavity, but the kidneys are imbedded in the fat layer and so they remain. Then you see the pig's head has been totally uncovered. I learned recently that you take the head and strip it of the jowls and skin, cut off the ears and tongue, and then roll them all up with a lot of spices to make a pig's head porchetta. As Underly cut, she explained the difference between prime, choice, and select grades of meat. At first a lot of the grading was subjective because it was all do to the training and opinion of each inspector. But now it’s all scientific with the use of scopes that electronically measure marbling, etc. Prime cut has the most marbling. Select is the leanest. Choice is in between. So it depends on if you want a lean cut or not. 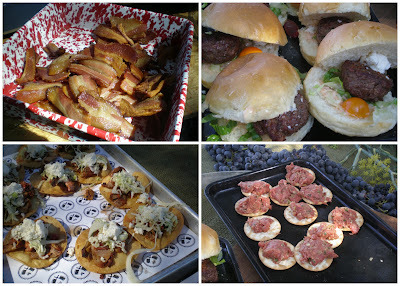 Different stations served the food. After just a couple of hours we were absolutely stuffed with meat. It was an Atkin's diet lover's dream. Really, there wasn’t much else unless it was an accompaniment to a dish. 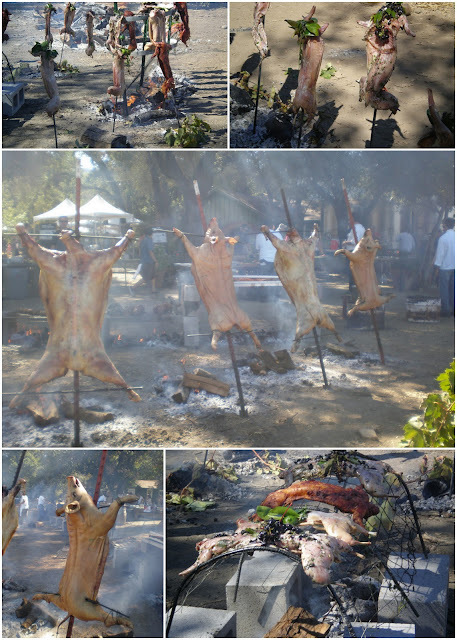 The event still had hours to go and the carcasses that we had seen being butchered were still cooking. A second wave of food was still to come, but we just couldn’t see eating even more meat. Besides, they didn’t have any non-alcoholic drinks for me and not much seating. If I get the opportunity to go again in the future, I’ll be sure to bring my own chair and beverages so that I can stay for the entire thing.